"Belinda and I would like to say another big thank you for your time on Wednesday and for the great feedback you offered our girls. They really do grow in confidence after that experience, and they were buzzing with excitement in the afternoon session. Most of the comments we received were around how nice you were, and how calm and at ease you made them feel. So, thank you and hopefully, we will see you again next year!" "I like the way your book combines personal and technical elements as well as your perspective as a judge." "A beautiful, strong message to guide you towards your competition and life goals! Enjoyed!" "Some great lessons to be had in this book highly recommend." "I will be recommending this book to all my customers. It has so much to offer, whether you're a serious competitor or a recreational rider." "Really great book, even if you are not a horse person. There are some great lessons, tips and wisdom here on life, on building better relationships and resilience. Don't let the fact it's called "Winning Horsemanship" put you off, it's a great addition to any personal development library." "This book is inspiring, heart-warming and insightful. It is a book to be enjoyed by animal owners, horse riders, competitors and judges alike. As an animal lover, I was impressed by Joanne’s clear respect and empathy for horses. So much so, I wish everyone who has anything to do with horses was made to read this book, so that they could ensure they treat them well too. Winning Horsemanship is as much about being a good horseman/horsewoman as it is about being a good person and living up to your potential. The advice provided is practical and effective. A fantastic read!" "Winning Horsemanship: A Judge's Secrets and Tips for Your Success by Joanne Verikios is a book for horse riders, a brilliant book that combines the author’s experience as a riding champion and judge with smart writing to offer invaluable lessons to readers on how to go past being mere amateur riders to becoming experts, creating an enjoyable and fulfilling experience that drives success. 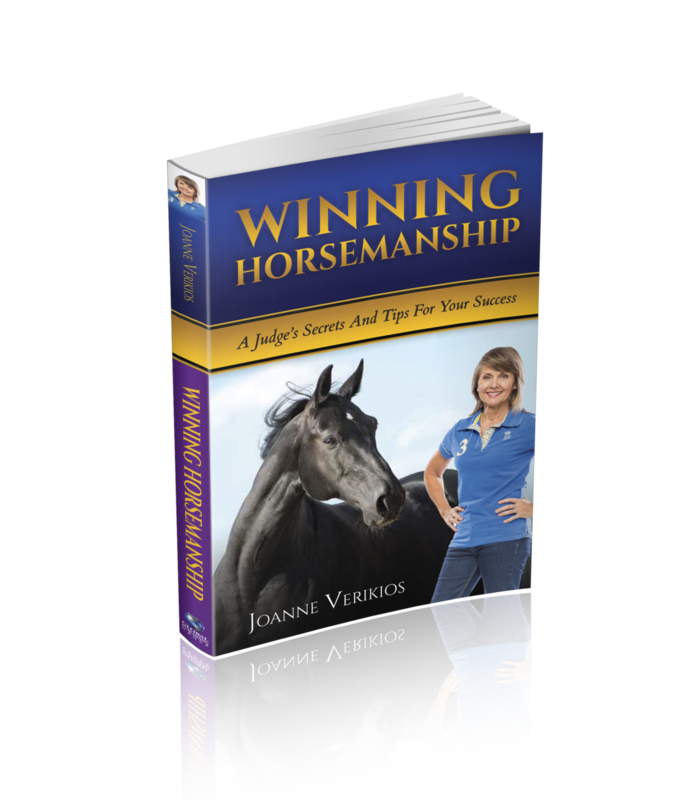 Joanne Verikios’ book will help readers understand and harness the techniques that can make them one with their horses, learn the secrets that expert trainers and riders use to win in the arena, understand the mistakes that can be costly, and learn how to use confidence and how to transmit it to their horses. In this slim but engaging book, the reader will learn how to prepare their horse for a competition, how to be ready for great performance, and a lot more. "Loved it! Your 'teaching to learn' & 'prepare' chapters are my focus - but I loved the whole thing. 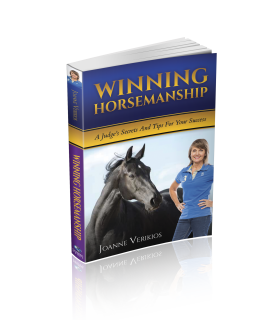 "I am reading Winning Horsemanship for the third time! It is the top book on the pile on my bedside table. Every time I pick it up I get a new gem of wisdom." "This book is a ‘must have’ if you’re wanting to take your competition career to the next level." "Dear Jo, I am not a horse person at all – they are not my cup of tea – but I really enjoyed reading your fabulous book. You are an amazing woman with so many fantastic accomplishments and your real stories about real people made it very interesting. The book is well written and easy to read; people who are into horses would stand to gain a lot from it." "Hi Joanne. Congratulations on your book. I have read your book for the second time and enjoyed it so much. I have never been a horse owner but in my business, over the years I have met and known many horse owners of all walks of life. I am sure 99% of these people would be better for the experience of reading your book. Your book is as much about the human involvement and self discipline and motivation as it is about the horse. People who have never owned a horse, or do not intend to get a horse, will get a great amount of pleasure and a greater understanding about themselves from reading your book." "The book covers a wide range of topics and some very useful tips. It is very motivating and hard to put down." "A person would read your book even if he weren't all that interested in horses, which I feel is the acid test." "Heartiest congratulations for producing such an interesting book which I so much enjoyed. It is written with great understanding and love for a remarkable animal."